Upon first sitting down to review David Lynch’s new album, Crazy Clown Time, the end goal was something akin to the following: “Don’t make too many Twin Peaks references. Don’t just talk about how great Wild at Heart is. Compare nothing to Eraserhead.” But it should have been obvious that a few comparisons to the weirdo-noir filmmaker’s oeuvre would slip in under the fingernails (damn it) and make their way in. In both themes and weirdness, this album compares to Lynch’s work, though it won’t make you think that he’s a musician first and a filmmaker second (painter third, coffee and pie aficionado fourth). But, really, this disc is at least worth picking up from your local record store wrapped in plastic (it’s happening again—damn). This isn’t the first time Lynch has been involved in music but it’s his first turn as a frontman, so to speak. He has composed music for a handful of soundtracks on his own projects (including a co-writing credit with frequent collaborator Angelo Badalamenti on the beautiful Twin Peaks theme), written lyrics for Julee Cruise, released a strange experimental rock album called BlueBob with John Neff, and come together with Sparklehorse and Danger Mouse (among others) for Dark Night of the Soul. This project is Lynch unfiltered and up to his old tricks, just in a new format. Crazy Clown Time plays out in many of the same ways that the filmmaker’s visual projects do. There are splinters of a narrative, floating in the middle of a heavy sea of dark images; old, bluesy, noir structure pushed through a postmodern, eerie filter. 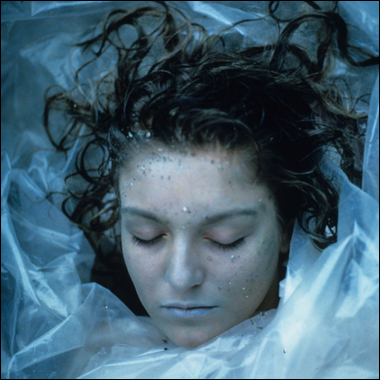 Lynch makes darkly familiar art; pieces that sound familiar though the subconscious knows that they ultimately shouldn’t, and that carries over to his music. It’s not very surprising, either — at least if you’re acquainted with the man’s subject matter. So despite the fact that the vocals to opening track “Pinky’s Dream” are provided by the Yeah Yeah Yeahs’ Karen O, the creator of this song is evident. That singularity of voice is something very important for an artist, and it’s something that Lynch has in spades. The lyrics surround the noir-y-named Pinky driving a car recklessly (cue flashes of the Lost Highway opening credits), while stuttered Western guitars and propellant drums push things at a clip. O’s hiccups and moans are the perfect element to give this song the claustrophobic drama that it needs; the listener and O cramped into the passenger seat as a maniac careens around the road. Lead single “Good Day Today” continues the dark imagery, but the change in vocalist makes a large impact. For fans, Lynch’s voice is equally recognizable, his nasal twang pulsing through the mechanized effects piled on top of it. While the narrative doesn’t directly connect to the first track, the desperate hope for a savior from a dark situation carries through. The repetition of the voice being “so tired of fire, so tired of smoke” is another insistence of danger from a mind predisposed to find it. Musically, “So Glad” carries these themes, but lyrically, the narrator becomes the danger. A slow, bluesy stomp lingers lowly at the back of the track, but the percussion hits peaks that crack the recording, while a crunching guitar a la Neil Young on the soundtrack to Dead Man haunts the corners. “Free in my house,” Lynch croons, presumably with a crazy grin on his face. That creepy blues continues on “Football Game,” but here Lynch sings with the proverbial underpants stuffed into his mouth (seriously, look it up). The single exhortation of the title “I Know” at its introduction is enough to send a shiver down the spine, Lynch’s voice suddenly distanced from any empathy. Without the filter on the vocals and the occasional bursts of feedback and dissonant noise, this track would be a pretty traditional blues number. Lynch has taken something very familiar to anyone who has listened to music in the Western world and turned it into something chilling, creepy, utterly Lynch-ian. That said, sometimes the album gets too bogged down in its bluesy weirdness and signature sound to worry about coming up with hooks to keep the listener in the world. When songs do have a strict chorus (“Good Day Today”), it relies on repetition of a single phrase like someone else’s unexplained mantra. But there are also songs without any attempt at a hook whatsoever. Sometimes that works, as on the uber weird “Strange and Unproductive”, an eight minute spoken-word rant that falls somewhere between Daniel Higgs and Tom Waits, only put through an Auto-Tune-esque sieve. Other times, it fractures the album; for example, the bleak instrumental “The Night Bell With Lightning”, which suffers from feeling like a soundtrack lacking any image. The fusion of old and new, of minimalist techno and grungy blues, of chaos and cold calculation is something that Lynch does so well in his films, and it’s something that he ultimately puts to intense use on this record. No matter what any of the songs sound like, Lynch stands center stage, his fingerprints over every single element of the music. The expressive, emotive features on this album create a real response in the listener, from familiarity to icy discomfort.